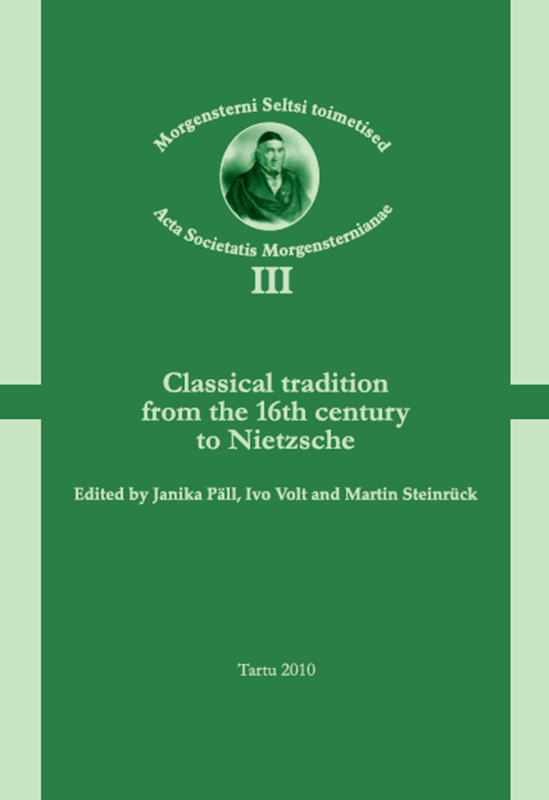 Acta Societatis Morgensternianae is a book series published in cooperation with the Department of Classical Studies of the University of Tartu, and Morgenstern Society. The latter was founded in 1999 with the aim of promoting the study of classical philology and related disciplines – ancient history and philosophy, classical archaeology, Medieval and Neo-Latin philology, Byzantine studies and the whole heritage and reception of antiquity in Estonia and beyond, connecting people who are engaged in these areas, and expanding international cooperation. The Society has been named after Johan Karl Simon Morgenstern (1770–1852), professor of rhetoric, aesthetics, Greek and Latin language and the antiquities at the University of Tartu, who was the founder of classical philology in Tartu. Vol. 1. 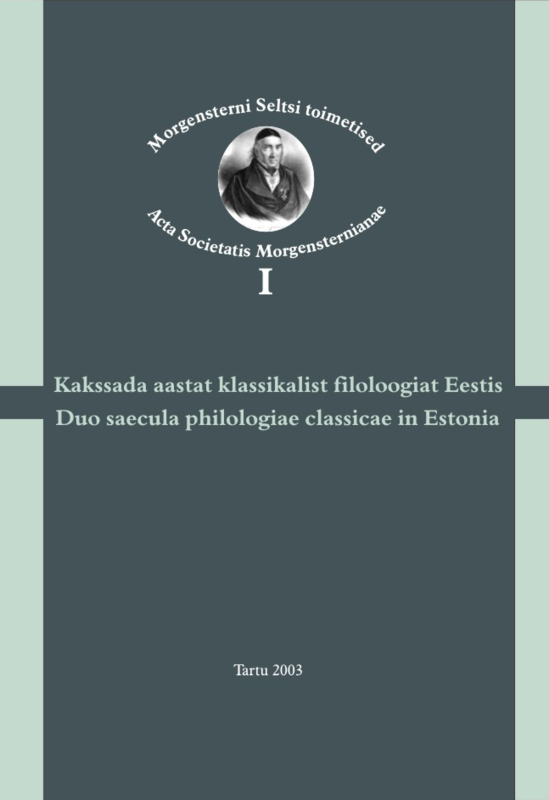 Kakssada aastat klassikalist filoloogiat Eestis = Duo saecula philologiae classicae in Estonia. Koostanud ja toimetanud Ivo Volt. Tartu: Tartu Ülikooli Kirjastus, 2003. 176,  p. ISBN 9985-56-826-5. This volume is dedicated to the 200th anniversary of the establishment of classical philology as an academical discipline at the University of Tartu (1802). It contains Estonian papers with summaries in either English or German. Contributors include Katre Kaju, Inge Kukk, Mait Kõiv, Anne Lill, Maria-Kristiina Lotman, Juhan Maiste, Janika Päll, Kaarina Rein, Merike Ristikivi, Jaan Unt, Kristi Viiding, and Ivo Volt. Vol. 2. 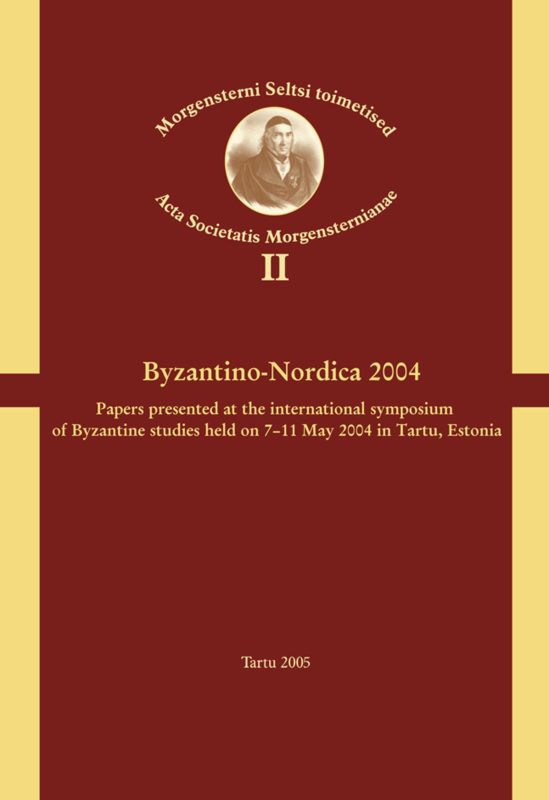 Byzantino-Nordica 2004: papers presented at the international symposium of Byzantine studies held on 7–11 May 2004 in Tartu, Estonia. Edited by Ivo Volt and Janika Päll. Tartu: Tartu University Press, 2005. 196,  p. ISBN 9949-11-266-4. The volume is a collection of conference papers. The papers are presented in two sections: the first is for Byzantine studies proper (i.e. for papers discussing the authors, architecture, cultural or political history of Byzantium); the second contains papers about Byzantine, Patristic or Greek studies in Estonia. The papers are in English and German. Contributors include Mikhail Bibikov, Markus Bogisch, Ljudmila Dubjeva, Karsten Fledelius, Kalle Kasemaa, Anne Lill, Janika Päll, Kaarina Rein, Jan Olof Rosenqvist, and Torstein Theodor Tollefsen. Vol. 3. Classical tradition from the 16th century to Nietzsche. Edited by Janika Päll, Ivo Volt and Martin Steinrück. Tartu: Tartu University Press, 2010. 202,  p. ISBN 978-9949-19-618-0. The papers in this volume are dedicated to classical tradition, and are divided into three sections. The first section focuses on Neo-Latin in the Baltic Sea region in the 17th century, the second deals with Humanist Greek in the same region and period, while the third is dedicated to Friedrich Nietzsche and classical tradition in philosophy. The papers are in English and German. Contributors include Katre Kaju, Tua Korhonen, Anne Lill, Janika Päll, Martin Steinrück, and Kristi Viiding. Vol. 4–5. 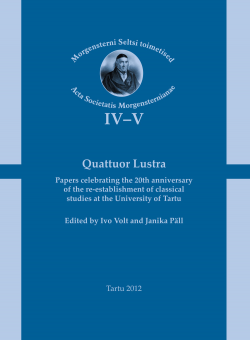 Quattuor Lustra: Papers celebrating the 20th anniversary of the re-establishment of classical studies at the University of Tartu. Edited by Ivo Volt and Janika Päll. Tartu: Tartu University Press, 2012. 400,  p. ISBN 978-9949-32-067-7. The papers in this volume have been gathered to celebrate the 20th anniversary of the re-establishment of classical studies at the University of Tartu (1990). The subjects pursued range from Hittite and Homeric etymology and lexicography all the way to social and political situation at the University of Tartu in the 19th century. The papers are in English, German, and Latin. Contributors include Michail Bibikov, Carl Joachim Classen, Hans Helander, Heinz Hofmann, Maarit Kaimio, Otto Kaiser, Mika Kajava, Peter Kuhlmann, Anne Lill, Walther Ludwig, Outi Merisalo, Heinz-Günther Nesselrath, Danny Praet, Jaan Puhvel, Paavo Roos, Heikki Solin, Martin Steinrück, Levente Takács, Horatio Caesar Roger Vella, Jürgen von Ungern-Sternberg, and Gregor Vogt-Spira. Vol. 6–7. Hellenostephanos. Humanist Greek in Early Modern Europe: Learned Communities between Antiquity and Contemporary Culture. Edited by Janika Päll and Ivo Volt. Tartu: University of Tartu Press, 2018. 472 p. ISBN 978-9949-77-758-7. The rebirth of Ancient Greek in Europe was promoted by Humanist education and ideas to such an extent that we can consider the Greek language as a formative element of Humanist culture. Next to Latin, the default common language, a Humanist has to know and use Greek, because he is not, cannot and will not be a barbarian: βάρβαρος οὐ πέλομαι, as Julius Caesar Scaliger claimed in his verses in 1600. Wreaths (στέφανοι) have been the symbols of the cult of Muses from ancient times. After the love for Greek Muses had been revived by Renaissance Humanist poets and scholars, it has remained with us both in poetic activity and in scholarship. 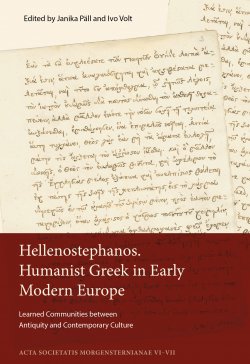 The Hellenostephanos volume presents a collection of papers by scholars who study Humanist Greek, aspiring towards another revival of Hellenism, and trying to avoid being barbarians. The volume includes papers by Christian Gastgeber, Gita Bērziņa, Janika Päll, Charalampos Minaoglou, Erkki Sironen, Kaspar Kolk, Tua Korhonen, Johanna Akujärvi, Bartosz Awianowicz, Jean-Marie Flamand, Walther Ludwig, Alessandra Lukinovich, Martin Steinrück, Tomas Veteikis, Grigory Vorobyev, Vlado Rezar, Pieta van Beek, and Antoine Haaker.